As teachers, we prepare our students for the world beyond the classroom, and we hope we are providing them with ample opportunities to interact with authentic and relevant situations; but rarely do we get the chance to experience workplaces outside of education. This summer, I was given this rare experience when I interned in the Structural Adhesive Department of LORD Corporation’s Process Development Center as a 2018-19 Kenan Fellow. Working in their facilities broadened my perspective as an educator and reminded why I do what I do. Inside the labs, I shadowed chemists and chemical engineers who were creating industrial adhesives. One of my mentors, John Lean, described some of the new types of adhesives the team was working on, along with showing me hundreds of thousands of dollars of equipment used to test adhesives. My mind churned with ideas I could bring back to my kindergarten students — big picture ideas that would help them see the value in science and how it solves problems that affect our daily lives. Starting with the end in mind, I asked my mentor what he sees as a need in preparing students for STEM careers such as the ones available at LORD. He described the impact that many variables play in affecting different outcomes of the same process, and then handed me a large notebook of process mapping information, accompanied by the actual process I would experiment with during my externship. I was tasked with completing the same process repeatedly, bonding two metal coupons with the same adhesive; and after the samples cured, I would use an Instron machine to measure the force required to pull the metal coupons apart. I had to create a process map to outline the steps, and then identify any input variables (room temperature, dispersion of adhesive, coverage of substrate, amount of glass beads, size of static mixer, etc.) that could influence different outcome variables in the process. The ultimate goal of my experiment was to control the input variables as much as possible in order to obtain similar results each time. My first thought: Kindergarteners? Variables? Process mapping? Hmmm … this should be interesting. My third thought: There must be value in this process … what is it, and how can I share it with my students? When I thought back to how LORD affects the daily lives and safety of people with their products, I realized why it was so important that a process is as controlled as possible to produce consistent results. At that moment, my mind started spinning with all the ways that I could capture those big picture ideas in lessons with my Kindergartners. Based on my experiences at LORD, I designed a series of lessons for young learners that would replicate the creation and testing of adhesives that chemists and chemical engineers at LORD take part in. In this series of lessons focusing on adhesives, young learners get to experience the engineering process scientists work through and consequently learn some of the challenges that scientists encounter as they create and test. In the first lesson, groups of students create different batches of the same adhesive recipe and see the different variables and properties that impact different levels of strength among each batch of adhesives. We test the force taken to pull apart 2 wooden pieces bonded by the adhesive samples, using a spring scale; which is a direct replication of my testing process at LORD. This lesson brings a blend of hands-on, messy fun; the real-world perspective of scientists and the influence of variables in what they create; the literacy integration of text that promotes creativity with glue; and the informational writing students create in their collaborative process maps. For the second lesson, the students see how one common variable, wood, interacts with changing adhesive materials (tapes, Play Doh, Velcro, and glues). As students rotate to different stations creating 2D and 3D wooden structures bonded by different adhesives, they see how the different properties of each adhesive interact differently with wood. In the final lesson, students use what they have learned about variables and properties to create cargo ships in collaborative teams. After studying the science behind adhesives, they see how adhesives impact our world and are necessary for creating structures that solve community problems. Students create their ships according to a series of steps I have made for creating a product, taken from a blend between the engineering design process and LORD’s Stage Gate Business Model for launching products. And finally, students choose a way to present their product and learning to others. 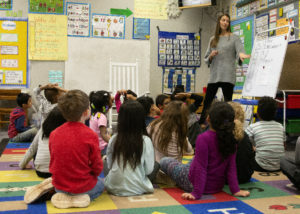 Prior to this Kenan Fellowship and externship experience at LORD, I could not have imagined creating a series of lessons for kindergarten students in which they would be using and applying extensive vocabulary (terms like adhesive, substrate, bond, variable, force) in these lessons and beyond. But this experience has helped transform my own perspective of science, as well as how I present science to my students. When I was selected for this opportunity, I was thrilled! But I was also intimidated and unsure of how I would handle chemical research myself, much less share it with my 5 and 6-year-old students in a meaningful way. But my experience has taught me that I should never be scared to take on something that seems out of my element. Just because I have to wear a lab coat and safety glasses and am tasked with chemical research does not mean I can’t do it! Science is complex, but it is something anyone can do, even Kindergarteners! I do have to admit- despite the fact that young learners have been surprising me for years now, I still had questions about how these lessons would go. But as always, they showed me throughout the implementation of my project that #kindersCAN always take the challenge, when you just give them the chance!